Not staying here? Click Here. No Waiting for Regular Shared Airport taxis to fill up. Quick stop (Up to 15 minutes) at market or convenience store upon request. For arrivals driver will meet you on the way to baggage claim. For departures driver will meet you outside the lobby of your hotel or ferry terminal. This flight does not provide any tracking information for the driver. However, we can service your request. Please provide the required information. Most Airlines require you to be there atleast 2 hours in advance. American Airlines require you to be there atleast 3 hours in advance. * Disclaimer: Please note that these are our suggested times, but please verify with your airline with regards to how early you need to be there. Avoid waiting for shared St Thomas airport taxis to fill up, multiple stops to reach your destination and additional baggage fees. Book express private transportation to or from the St Thomas Airport, Cyril E King Airport, with our convenient, non-stop transfer service. Upon request, your driver will provide you with a quick stop (Up to 15 minutes - additional time will be billed by driver) at a market or convenience store on the way to your hotel, property or ferry dock. 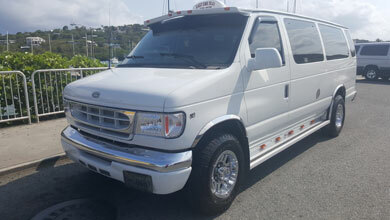 We offer one-way or round trip airport transportation to or from your place of stay and we also service the Charlotte Amalie and Red Hook ferry docks. Enjoy a smooth ride in your private vehicle, serviced by CaribbaConnect, including flight tracking to ensure timely pick-ups and drop-offs. For flight arrivals, your driver will be waiting holding a sign with your name on it. Our St Thomas airport transfers are ideal for individuals, couples, families, or groups. The number and type of vehicles are assigned based on the size of your party and availability, and all of our drivers and vehicles are fully licensed and insured. Best of all, unlike St Thomas airport taxi services that charge for bags and carry-on items, there are NO BAGGAGE OR LUGGAGE FEES with our service. Use our easy online form to check availability and book your airport transportation now! Service must be canceled within 48 hours of your scheduled pick-up. If your flight is canceled, please contact your driver to reschedule or cancel service and receive a refund. If you booked a roundtrip, you may only cancel 48 hours prior to the first leg of the trip. As a roundtrip is considered one service, you may not cancel any individual part of a roundtrip. All contact details provided upon confirmation of your booking.